This month is National Vegetarian Week, running from 15 to 21 May. Arjuna Wholefoods is a 100 per cent vegetarian health food store so we’re very much in favour of any campaign that encourages people to adopt a plant-based diet. A healthy, balanced vegetarian diet should include plenty of fresh fruit and vegetables, whole grains, pulses, nuts and seeds, as well as some dairy products and eggs. Here at Arjuna we stock a wide range of organic, seasonal fruit and vegetables, locally sourced wherever possible. We particularly enjoy searching out unusual and heritage varieties such as rainbow carrots, golden beetroots and Brussels sprout stalks, and all year round we sell exotics like bananas, avocados and fresh turmeric. We also stock a wide range of wholefoods which add flavour and interest to vegetarian cooking, from aduki beans to quinoa and cashews to cacao. A large proportion of our customers are vegetarian or vegan and so we offer a wide range of meat substitutes to fulfil this demand. Our fridge and freezer are stocked with both dairy and non-dairy cheese, yogurt and ice cream as well as vegetarian substitutes for burgers, sausages and paté. There is a huge variety of meat substitutes available now, compared to the 1980s when I first became vegetarian myself. Products that are particularly popular with our customers include flavoured tofu and Tofurky, which is made from a blend of wheat protein and organic tofu. We also stock a wide range of vegetarian ready meals and a range of frozen dishes, like curries, nut roasts and wellingtons which are always popular for a vegetarian Sunday lunch. People tend to lead very busy lives nowadays and don’t always have time to cook so it’s great that there are more ready-made options available now for those following a plant-based diet. There are lots of new companies popping up, offering new vegetarian products so it’s a very exciting time for the vegetarian and vegan world. At our store our own home-cooked vegetarian food is very popular. We offer lunch and meal choices ranging from salads and hummus to pasties and cakes. In addition to our vegetarian food range we also sell a range of vegetarian and vegan supplements. 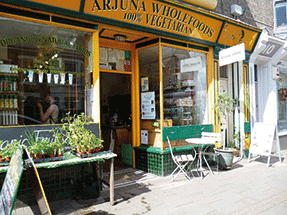 Arjuna has been a staunchly vegetarian store since 1970. In 1976 it evolved into a worker’s co-operative and our vegetarian ethos remains the same. We are always happy to offer advice to customers who want to switch to a vegetarian diet and we stock plenty of great cookbooks, which are full of delicious and healthy veggie recipes. We even have our own cookbook which has recipes dating from the 1970s and explains how the vegetarian world has changed over the past 40 years. The internet has certainly revolutionised things and there is a huge amount of information and research available now, backing up the health benefits of following a plant-based diet. We have certainly found that our customers are very clued up and informed. For anyone wanting to switch to a plant-based diet, I would say start out slowly, by eating one vegetarian meal a day at first and see how you get on. There is a wealth of veggie recipes to try, plus plenty of delicious meat substitutes, and you might find it easier than you thought. Your local independent health food store is always on hand to offer help and advice should you need it. Arjuna is based at 12 Mill Rd, Cambridge, CB1 2AD. It was initially established in 1970 as a whole foods store and restaurant by friends Patrick Boase, Sarah Eno and Andrew Moffat. It became a workers’ co-operative in 1976 and is fully and equally owned by those who work there. Now, 40 years later, Arjuna continues to meet an increased demand for well sourced sustainable food and provides an alternative shopping experience to the supermarkets. As a socially concerned business, Arjuna donates a percentage of its profits and goods in kind to local charities and community groups. The full history of the store is told in the book Wholefood Heroes, which is available in store.